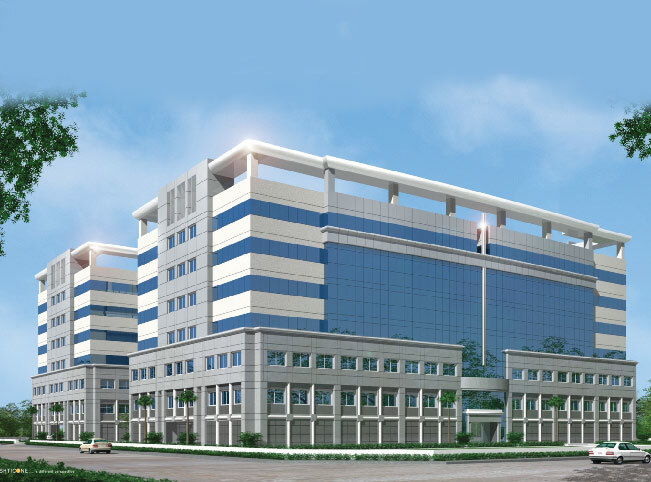 Surrounded by residential & well developed area, this exciting project is in Central Chennai, Ambattur industrial estate. Maximum travel distance from the working spot to Fire escape stair 20 Mtrs. Provided at Ground level as per NBC norms. Tap off connections provided above the False ceiling installations to be done by the Tenant. Dedicated UG Sump - 2 lakh ltrs. capacity for Firefighting system. 2 lakh ltrs. UG sump with hydro pneumatic system. Power supply - 11 KV HT power supply from T.N.E.B. 625 KVA - 1 No. 4 Nos of 'Mitsubishi' Elevators of 16 passengers capacity each and speed of 1.75 Mtr. per second. 1 No. of Service lift of 'Mitsubishi' Make of 20 passengers capacity and speed of 1.75 Mtr. per second. Parking:- 1 car park for every 1000 sq.ft. All Entrances and Exit points of the building manned by trained Personnel and 24 x 7 security. Concrete paving in main drive way and drop of Grasscrete and interlocked concrete precast pavers in other areas parking. Pole mounted fixtures and custom designed granite finished bollard lighting. Feature lighting of facade with fixtures concealed with landscape and other areas.